Following an intensive nationwide evaluation, GrowGreen Power Inc. has chosen Piedmont in central North Carolina as the location for its 50-acre greenhouse and 46.3-megawatt (MW) cogeneration plant. Synergy Dairy LLC in northwestern New York will partner with Florida-based technology developer CH4 Biogas LLC to develop a mixed-waste anaerobic digestion system at Synergy's dairy in the western New York town of Covington. The Sullivan County (Pa.) School District is installing a new biomass district energy system that will supply heating and hot water for the elementary school, high school and new administrative offices. The House Appropriations Committee didn't break from the vote of the Ag Appropriations Subcommittee to eliminate 2012 funding for the Biomass Crop Assistance Program, but new developments are stirring hope for the Rural Energy for America Program. South Carolina's state-owned power and water utility Santee Cooper has signed two power purchase agreements for a total of 3.2 megawatts of electricity that will be generated from two organic waste-to-power facilities proposed in South Carolina. A 140-megawatt biomass gasification plant in Vaasa, Finland, will be the largest of its kind in the world, providing heat for its small host community, as well as power for the grid. Production begins at largest wood pellet plant in Northeast U.S.
New England Wood Pellet LLC celebrated the grand opening of its Deposit, N.Y., wood pellet manufacturing plant on June 9. 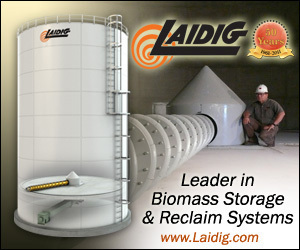 At 85,000 tons of pellets, the plant will produce enough renewable energy annually to heat 25,000 homes and businesses. The University of Greenwich's Wolfson Centre for Bulk Solids Handling Technology has completed a report that identifies and resolves common problems of fuel handling in cofiring of coal and biomass.